In large bowl, mix cookie mix, flour, butter and egg with spoon until soft dough forms. Measure 2 cups of the dough, and set aside remaining dough. Using the 2 cups of dough, firmly press a heaping tablespoon of dough into bottom of each muffin cup. Chop apple pie filling into small pieces; place a generous 2 teaspoons pie filling in center of each cookie cup. On floured surface, roll remaining dough 1/8 inch thick. Using small 1 to 1 1/2-inch cookie cutter, cut small shapes of your choice. If necessary, press any leftover scraps together, and reroll on floured surface to make total of 24 cutouts. Place one cutout on top of apple pie filling in each cookie cup. In small bowl, mix sugar and cinnamon; sprinkle on tops of cutouts. Bake 14 to 17 minutes or until edges of cookies are deep golden brown. Cool 10 minutes in pan on cooling rack. Run metal spatula around edge of each cookie cup to loosen; cool in pan 20 minutes. Remove cookies from muffin cups to cooling rack to cool completely. Store cookies covered at room temperature. 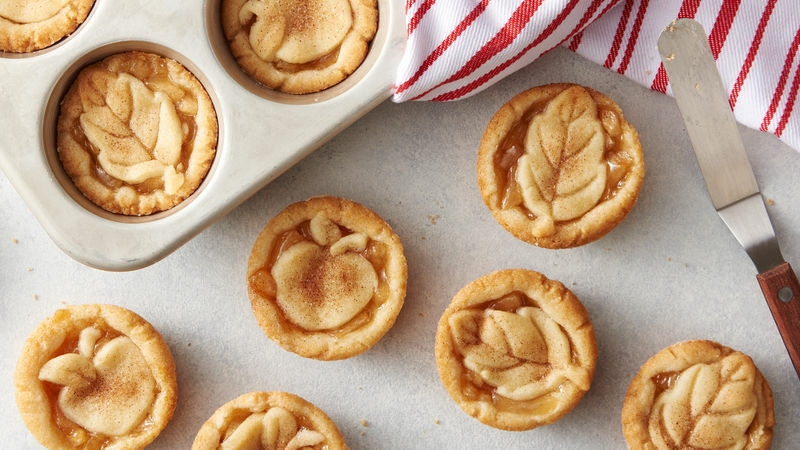 Small fall leaf cookie cutters are great for this recipe, but other shapes also work well.